The Snooze Button Generation would like to congratulate "Dazed and Confused" character Mitch Kramer for his victory in Game 1 of Wednesday night's World Series. Unfortunately, after the game, the pitcher was chased around Austin, Texas, and was paddled in the backside by his brother's friends. Those friends, though, were then cool enough to invite him to a party and give him a couple beers. Technically, Mitch Kramer, played by Wiley Wiggins, is a fictional character. But that doesn't mean Giants star Tim Lincecum is not a dead ringer for the teen in "Dazed and Confused." 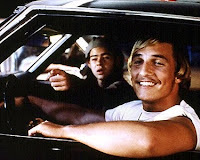 The SBG considers the 1993 film "Dazed and Confused" a classic. The movie is extremely funny and entertaining, but it has heart, too, and captures a side of teens not often represented in film. Even though Wiggins' career peaked with "Dazed and Confused," the movie's cast is like a who's who of acting - 17 years later. Matthew McConaughey, Ben Affleck, Milla Jovovich, Parker Posey, Joey Adams and Adam Goldberg all are in the movie. Their roles were, more or less, the biggest breaks for all of them, and many now see the movie as a cult classic because of its marijuana references. Yeah, maybe, but there's a lot more to it than that. What is even more amazing is that Wiley Wiggins somehow won the National League's Cy Young Award last year and inked a two-year, $23 million contract earlier this year. Apparently, it's never too late for a career change. Scary movies are too damn scary! The Black Max: Evil or genius?